Boil the pasta el dente in water with salt until 3/4 cooked. Mix in some olive oil and let it cool down on a tray. Roast the garlic in the oven at 150°C until puffed and soft. Clean the roasted garlic, chop and keep aside. Fry the onion, celery and carrot in olive oil. Add the white wine and allow the alcohol to boil out. Add 1 tablespoon of the chopped garlic. Add Knorr Napoli Tomato Sauce and simmer for 5 minutes. Add the mussels to the sauce and boil until they open. Squeeze some lime juice into the sauce. Mix with the pasta and serve. 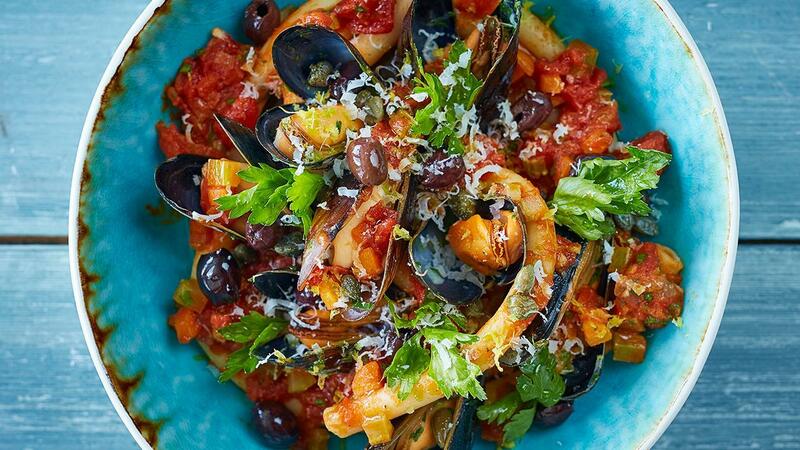 Spoon the pasta and mussels into a deep plate.